During its 62 years in operation, Ellis Island accommodated more than 12 million immigrants on their way to new lives in the United States of America. Beginning with Annie Moore, an Irish teenager and the very first immigrant processed at the station, Ellis Island lays claim to the ancestors of at least 40 percent of Americans today. In the latter half of the 19th century, religious persecution and political instability in southern and eastern Europe sparked the largest mass human migration in the history of the world. The federal government opened Ellis Island in 1892, two years after increasing immigration rates moved the issue from states’ jurisdiction to the federal government. While Ellis Island is commonly called the “Island of Tears,” most immigrants travelling to the United States in the 19th and early 20th centuries were treated courteously and respectfully. It was only after the outbreak of World War I that opponents of immigration successfully began placing increased restrictions on immigrants with regulations such as literacy tests, the Chinese Exclusion Act, the Emergency Quota Act, and the National Origins Act. 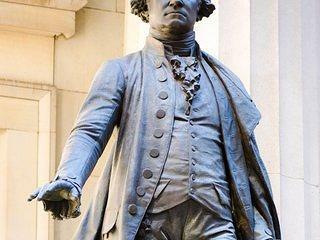 Immigration rates declined sharply due to these restrictive and often xenophobic policies, intended to exclude Asian and southern and eastern European immigrants from traveling to the U.S.
By establishing new national monuments or enlarging existing ones, our leaders have been able to preserve precious places for future generations to experience and enjoy. In 1965, 11 years after Ellis Island was officially closed, President Lyndon B. Johnson declared the immigration station a part of the Statue of Liberty National Monument using the Antiquities Act, which has enabled 16 presidents to protect significant historic sites across the United States. 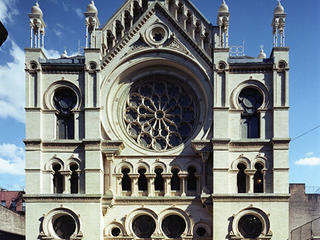 In 1984, the island underwent the largest historic restoration in United States history, and the Main Building reopened to the public with great fanfare in 1990. 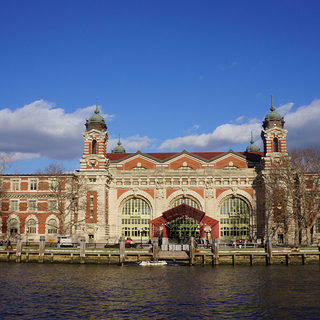 Other buildings on the island’s north side have been restored as part of the Ellis Island Immigration Museum, thanks to a successful partnership between the National Park Service and the Statue of Liberty-Ellis Island Foundation. On May 20, 2015, the Peopling of America Center was complete, and the entire museum was renamed the Ellis Island National Museum of Immigration. 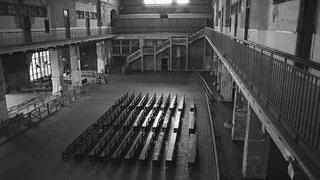 Ellis Island's Main Hall, circa 1980. Interior view of the monument's Main Hall today. 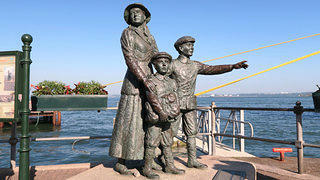 Statue of Annie Moore and her brothers, the first immigrants to pass through Ellis Island. 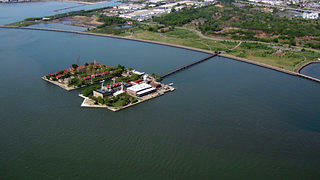 Aerial view of Ellis Island National Monument. 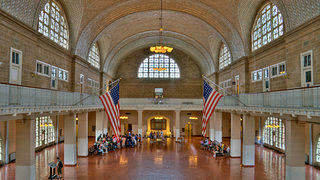 Learn how you can play a role in saving places like Ellis Island. Sign up today.